Saturday night found Motor Man and me at Langley Speedway, our local short track, in Hampton, Va. When we arrived, it was a beautiful evening with practically no chance of rain. This was to be the biggest race of the season. There are, on average, 15-18 cars entered in the Late Model division on race night at Langley. There were 37 there Saturday night, with many out-of-town drivers signed up for this special race, called the Hampton Heat. Late Model races are usually either 100 laps, or,sometimes, two 75 lap races during the night’s racing program. The Hampton Heat is 200 laps. Before race time, Motor Man and I went “in the pits” to visit with our engine customers and racing friends. Everyone was watching the sky, but at that time, it appeared that the rain would move to our east. Shortly before the 7:00 pre-race activities were to begin, it started to rain. It wasn’t a particularly long shower, and, once it stopped, the track-drying process began. If you are a race fan, you’re probably familiar with the jet-dryers at the large tracks. Langley doesn’t have those. 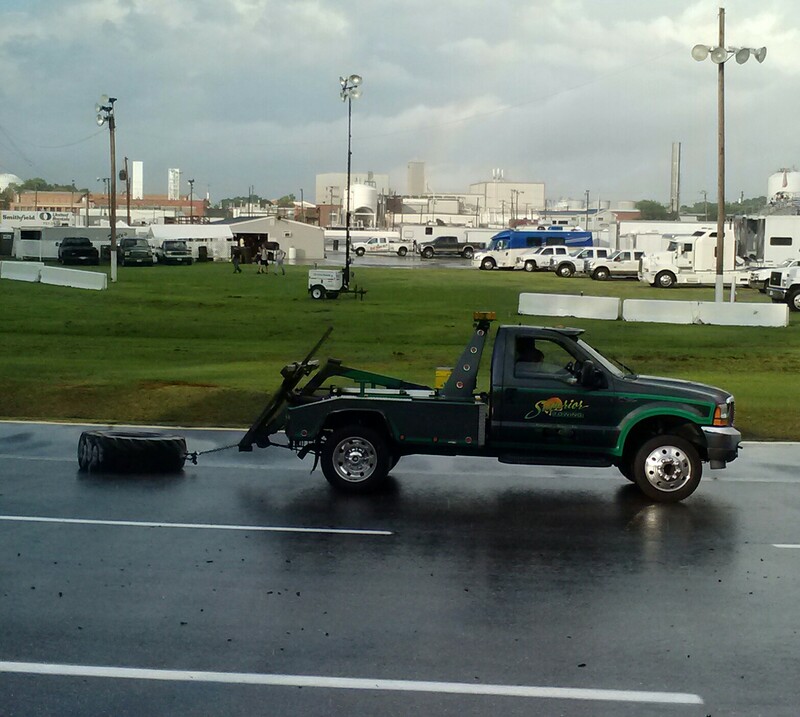 There are a couple of small walk-behind dryers, but the main method used to dry the track is a tried and true one: old tires chained to the back of several tow trucks at the track. The trucks make lap after lap after lap around the track, and the tires create friction, which dries the track. When the tires begin to smoke, you know you’re getting close. 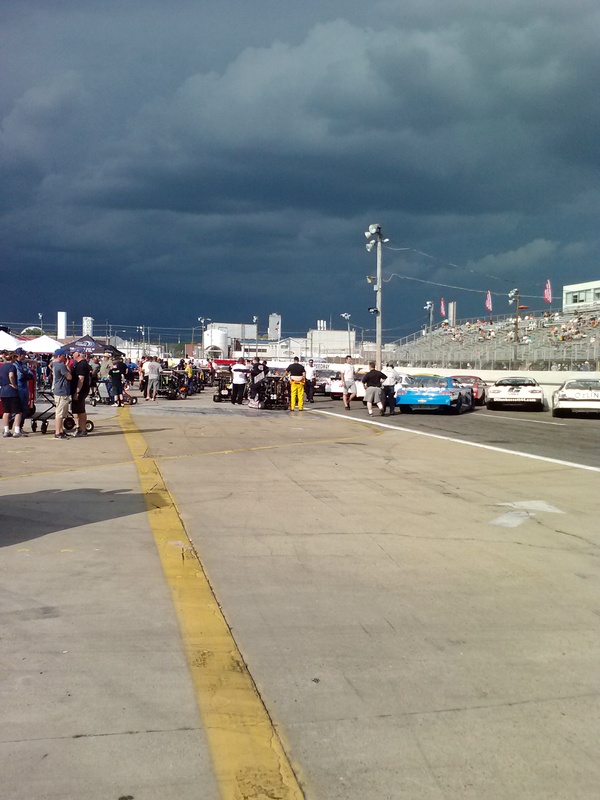 Before the races could begin, however, another rain shower came…this one much more intense than the first. This was the view through the windshield of our truck. At least, after this storm passed, we were treated to a rainbow. But it took much longer to dry the track the second time. 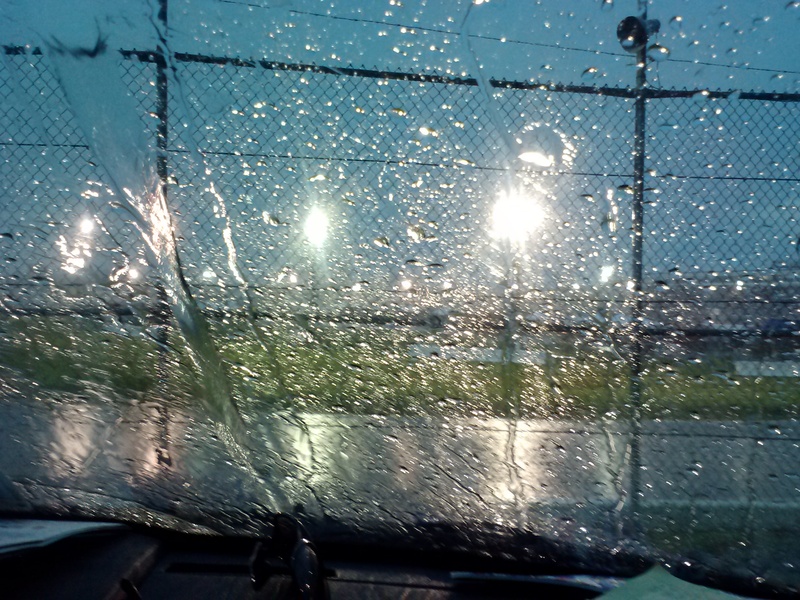 Thankfully, Motor Man and I have trackside parking, so we were dry and cozy in our truck. The Late Model race began around 11:15, and it was around 1:40 when the checkered flag waved. Motor Man and I left the track at 3:20. A.M. As in morning. It was just about 4:00 when we got home. We stopped and picked up our Sunday paper as we drove in the driveway. 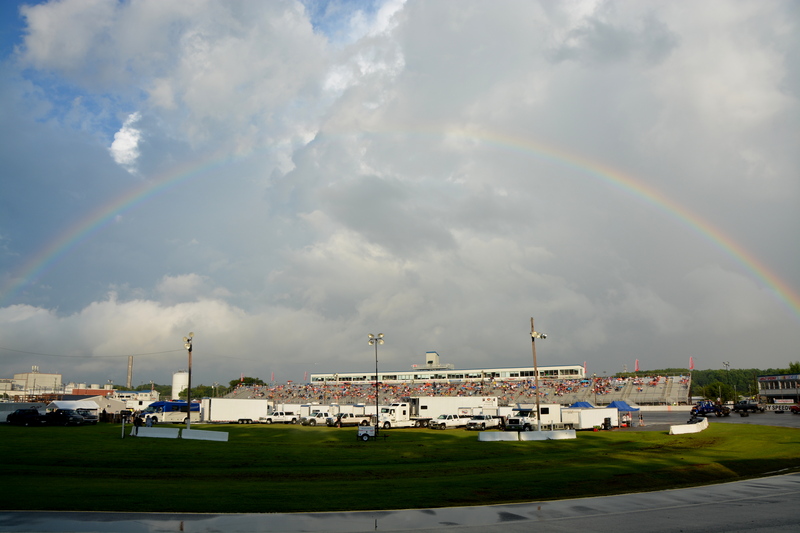 This entry was posted in Family, Racing and tagged Hampton Heat, langley speedway, late model races, rain, rainbow. Bookmark the permalink. What an evening – didn’t know that was how they dried the track, but I think the prize that night was the beautiful rainbow framing the stands. Sounds like you were up about 24 hours that day! Very interesting Dianna! I don’t know too much about car racing.. I know I like to go fast.. 😀 The pretty rainbow had to be a wonderful surprise! Oh my goodness. I would have been dead at that hour! 🙂 I did not know the dragging the tires behind the truck method of track drying. I guess it makes sense! We used to go to NASCAR races when we lived in Mooresville, NC and Mr. Diamond worked concessions at a sprint track when he was a teen so we know a teeny bit about racing. The crowd at NASCAR was always much more interesting than the actual race…. I can’t believe after a couple of hours sleep you and MM were on your way to the boat races. That was some weekend! What a night. I’m sure you all rested well on Sunday reading the paper much later in the day. You had a night in “Susie’s World”! I love the night time. Hope you got to sleep in…also a part of “Susie’s World”. Certainly long hours but you most have enjoyed the race to stay that long! The rainbow was a special treat for you guys. Wow, I would never have been able to stay awake! I’d be dozing away in that truck for most of the night. Too sleepy me. Well, Cindy, some of that certainly did take place!! Wow! I know I had rolled over several times by 4 AM ! – great pics to tell the story ! Wow, those are some scary storm clouds. I hope you rested up, Dianna! Great storm cloud and rainbow pics! That is one really late night…. or should I say really really early morning! We’re race fans too! We’ve been to New Hampshire twice already … great fun! That made for a long night! And you got home in time for sunrise photos! I’m glad you were able to get in out of the storm, and what a perfect rainbow shot! Dianna, Thank you for sharing part of your holiday weekend with Randy and I. I believe people come into your lives when they are needed and stay for as long as they can. I can see us being friends for a long time. And thank you for the beautiful pictures you create. You are gifted.